For the fourth time, the Philippines won the Miss Universe crown. 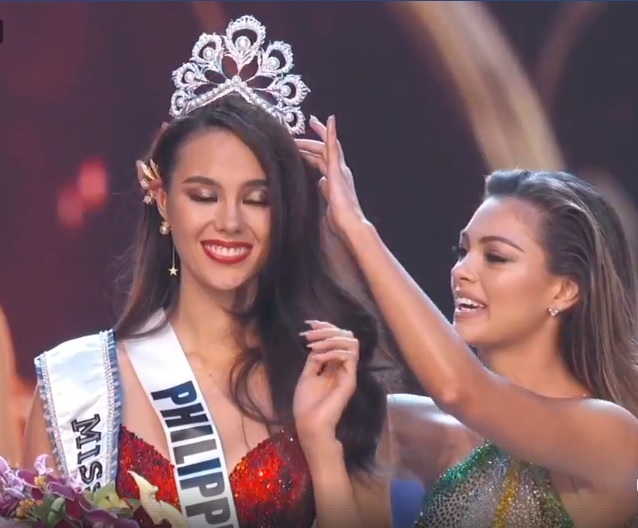 Thanks to Catriona Gray, 24. Besting 93 candidates, Gray was crowned Miss Universe 2018 at the IMPACT Arena, Exhibition and Convention Center in Muang Thong Thani, Bangkok, Thailand on December 17, 2018. She inherited the crown from Miss Universe 2017 Demi-Leigh Nel-Peters of South Africa. Gloria Diaz, 67, of Aringay, La Union and Margarita Moran, 65, of Davao won the first Miss Universe crowns for the Philippines on July 19, 1969 in Miami Beach, Florida, United States and on July 21, 1973 in Athens, Greece. On December 20, 2015, Pia Wurtzbach won the third and most recent Miss Universe crown for the Philippines in Las Vegas, Nevada, USA. Miss Universe 2018 marked the first time the beauty pageant had an all-female selection committee. The judges of both the preliminary competition and the coronation night were Liliana Gil Valletta, Janaye Ingram, Monique Lhuillier, Michelle McLean, Iman Oubou, Bui Simon and Richelle Singson-Michael. Gray is now the second woman to finish in the Top 5 of Miss World before winning the Miss Universe crown. The first one was McLean, who was Miss Namibia 1991, Miss World 1991 fourth runner-up and Miss Universe 1992. The Miss Universe 2018 coronation night was hosted by Steve Harvey along with Ashley Graham, Carson Kressley and Lu Sierra. American singer-songwriter Shaffer Chimere Smith, who is professionally known as Ne-Yo, performed during the event. Runner up to Gray as Miss Universe 2018 was Miss South Africa Tamaryn Green. Miss Venezuela Sthefany Gutierrez was second runner-up. Also a winner of the evening was Miss Laos On-anong Homsombath who won Best National Costume. Miss Spain Angela Ponce did not make it to the quarterfinals but she was honored onstage as the first ever transwoman Miss Universe candidate in the international level.